Melissa Odabash "Barcelona" swim top in solid microfiber. Removable pads and straps included. As a former swimwear model who lived and worked in Italy for many years, Melissa Odabash has an innate sense of what women want from their swimwear & beach wear. From the inception of the brand, the collection has been developed and constructed to sculpt and enhance the silhouette. Timeless pieces designed with clean lines and innovative textiles aim to adapt to all body types, making them a must- have for the distinguished global traveler. For in-store inquiries, use sku #2420499. Marysia "Antibes" swim top in solid microfiber. 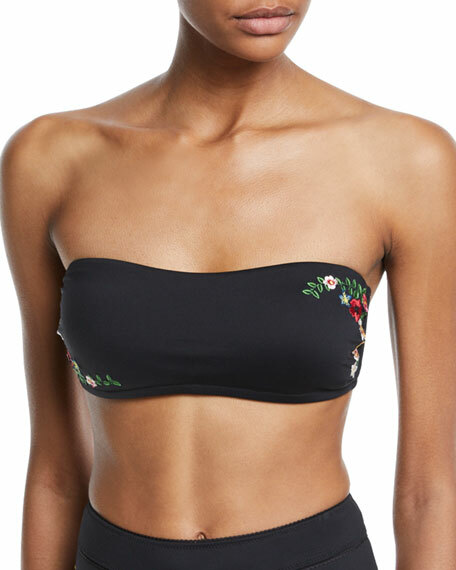 Bandeau neckline. Scalloped edges. Fastens at back. Nylon/Lycra® spandex. Imported of Italian material. Model's measurements: Height 5'11"/180cm, bust 34"/86cm, waist 24"/61cm, hips 34"/86cm, dress size US 2.